Ron Chew, executive director of the International Community Health Services Foundation, said his recently completed book on Silme Domingo and Gene Viernes, two young cannery union officials murdered in 1981, is the most difficult piece of writing he’s ever done. 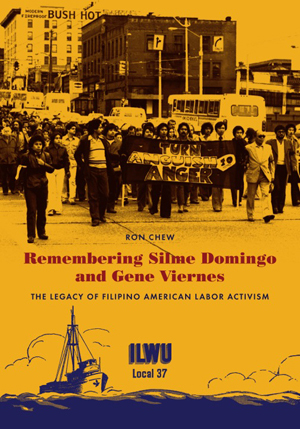 The book, “Remembering Silme Domingo and Gene Viernes: The Legacy of Filipino American Labor Activism,” will be released at a free book launch on Thursday, Feb. 2 at 6 p.m. at the Wing Luke Museum. The book is published by the University of Washington Press in collaboration with the Alaskero Foundation, which provided financial assistance to underwrite the project. During the late 1970s, Chew worked as editor of the International Examiner, published at the time by the Alaska Cannery Workers Association (ACWA). Domingo and Viernes were leaders of the ACWA. Chew worked closely with the two, helping behind the scenes with writing, designing, and editing of cannery worker materials, in addition to his work on the newspaper. Domingo and Viernes and other young Asian American cannery workers spearheaded three class action racial discrimination lawsuits against Alaska salmon canning companies and were involved in a campaign to reform the cannery union. On June 1, 1981, Domingo and Viernes were gunned down in the Pioneer Square union hall in an intricate conspiracy involving the union president and agents tied to Philippine dictator Ferdinand Marcos. In the 10 years following the murders, four men went to prison for their roles in the shootings, and courts ordered the Marcoses to pay restitution to the families of the two slain men, prominent opponents of the Marcos regime. The 150-page book consists of three sections: an essay, simply titled “The Era,” about the lives of Domingo and Viernes in the context of the Civil Rights movement of the 1970s; 23 individual oral histories with family members and activists sharing personal reflections; and an unfinished manuscript written by Viernes. In late 2010, Chew proposed the book project to Terri Mast, Silme Domingo’s widow and national secretary of the Inlandboatmen’s Union. Shortly thereafter, Mast and other activists who had worked with Domingo and Viernes gathered at Chew’s house to discuss what form the book might take. “It turned out that at the heart of the book are the oral histories of folks like Terri and others who have continued to fight for equality and social justice in the three decades since the murders,” Chew said. At the time of the murders, Viernes had been working on expanding a seven-part series on Asian laborers in the salmon canning industry — originally published in the International Examiner in the late 1970s — into a full book. Chew had been assisting him on the project. Last year, Chew worked to refine Viernes’ rough manuscript into a more finished form for the book, pairing it with images which Viernes had intended to use. Chew acknowledged the strong support of Ed Echtle, who spearheaded the research efforts, Debbie Louie, who transcribed most of the oral histories and designed the book, and Shannon Gee and Pei Ju Chou, the videographers who recorded the interviews. The project materials have been donated to the Wing Luke Museum. For more information about Chew’s book launch on Feb. 2, visit wingluke.org/events/upcoming.htm.